UNM School of Architecture and Planning Associate Professor Tim B. Castillo is taking on a new role at the University to organize and direct initiatives in Santa Fe. Interim Provost Richard L. Wood announced he appointed Castillo as UNM special advisor to the provost for Santa Fe initiatives, effective Jan. 7, 2019. The position is intended to spearhead UNM’s efforts to be the central higher education leader in the redevelopment of the former College of Santa Fe campus and build the institutional relationships with the City of Santa Fe and private sector partners – particularly in the fine arts and design areas for upper division and graduate coursework. Castillo will also work to engage with other New Mexico and adjacent state higher education institutions to ensure complimentary efforts in this sector. Castillo holds a bachelor’s degree from UNM in architecture and a master’s degree in architecture from Columbia University. 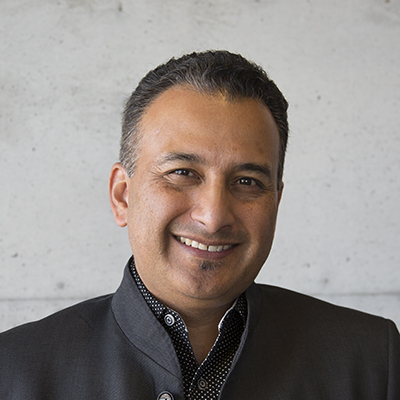 He is a tenured associate professor at UNM’s School of Architecture and Planning (SAP) and is also the Associate Dean of Student Engagement and Academic Innovation there since 2016. He joined the SAP faculty in 2002, and in 2009 became a member of the Interdisciplinary Film and Digital Media (IFDM) faculty. Castillo was formerly the Director of the Art, Research, Technology and Science Laboratory an interdisciplinary digital media laboratory at The University from 2010-2016. While at UNM, Castillo has been pursuing new pedagogies that explore applications related to emerging digital technologies and innovation. His architectural studios and seminars investigate new progressive strategies for design that are defined by culture, digital media and emergent fabrication processes. In the summer of 2015, he co-founded the Finding Rural/Plata Studio design program. The program was established as a partnership between Western New Mexico University, UNM SAP and the School of Architecture at Woodbury University to collaborate with communities in southern New Mexico and explore the roles architecture and design play in economic development. Castillo’s prestige extends well beyond the classroom. He was recognized nationally and internationally by the Association of Collegiate Schools of Architecture (ACSA) and was the American Institute of Architecture Students (AIAS) National New Faculty Teacher in 2007. He was also the Director of the ARTS Lab which was selected by the International Digital Media Association of Arts as the national digital media laboratory of year in 2013. His work has been published and exhibited nationally and internationally in various locations including the Institute for Advanced Architecture of Catalonia (Spain), Ecole Polytechnique Fédérale de Lausanne (Switzerland), Pavillon de l’Arsenal (France), Bienal of Sao Paulo (Brazil), as well as many other venues.